“Find Someone Who” is a cooperative learning structure that is terrific to get students up and moving, as well as interacting with each other. 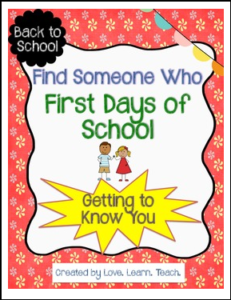 This version is perfect for the first week of school! It is a great way to break the ice and get students interacting with one another. If your students like this activity, please consider CLICKing the STAR to FOLLOW ME for product updates! Additional versions of this product will be available soon! Depending on the concept, students may spend 10-20 minutes completing the activity. Directions for this cooperative learning structure are included. Other versions of “Find Someone Who” are available here. Click HERE for FREE samples of Spiral Daily Math Review! Check out BACK TO SCHOOL items here! Check out END OF THE YEAR items here! Please email me if you have any comments, suggestions, or requests for future versions of “Find Someone Who”: love_learn_teach@yahoo.com .